Greater Philadelphia Bicycle News: Can Bike Lanes Float? I thought this was interesting concept, floating bike lanes. Useful on streets with part time parking such as Race St and Chestnut St. When parking is not allowed the area between the two solid stripes becomes a travel lane and the right side of the parking lane becomes a bikeable shoulder. 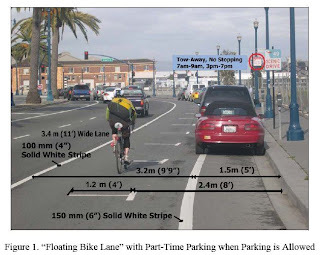 The picture below is a floating bike lane along the Embarcadero in San Francisco. Note that door zone is marked with the parking hash marks. Dang, when I saw that headline I thought for sure you'd found a way to run a bike path the length of the Schuylkill AND the Delaware rivers. When I was out in San Fran last September for the big APBP conference in Davis I had an opportunity to ride the floating bike-lane along the Embarcadero. It was NOT all that intuitive. I rode it when parking was not allowed. Car drivers seemed to understand the concept but I felt a little unnerved. It didn't help that the stripes and paint had come up in many places. The "T"s you see in the picture however do a great job of keeping cyclists out of the door zone.